Recently I’ve been collecting retro gaming consoles such as the Gameboy and SNES and whilst playing a game on the SNES I actually lost all my saves when I turned it off (turns out the battery got disconnected from the cartridge). The thought came to me, how can I backup the save game from these devices? There are cart readers around but they seem to be harder to find in this day and age so I thought why not make one myself using the Arduino as it’s so versatile! Before I begin looking into extracting the save games I’ll look into dumping the ROM which was a way for me to learn how to communicate with the Gameboy cartridge. I’ll now guide you in how to communicate with the Gameboy cartridge to read the ROM so without further delay, let’s begin! 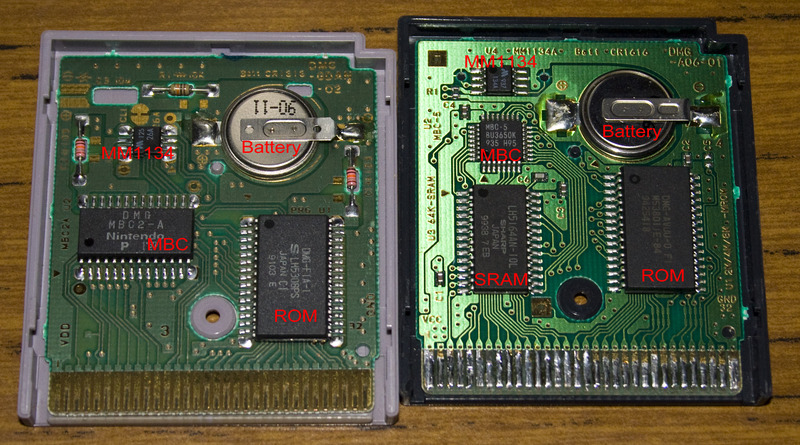 MBC is the memory bank controller, it allows us switch ROM banks to read the game’s data from the ROM. For reading the ROM we are only interested in the WR, RD, A0-A15 and D0-D7 lines. The Gameboy can only address 16bits (16 address lines: A0-A15) which means that the number of combinations of addresses is 2 ^ 16 = 65,536 with 1 byte for each address means that 65,536 bytes can be read/written to. These 16 address lines also control the Gameboy’s internal RAM, etc and so they decided to assign the addresses 0000h to 7FFFh for the Gameboy’s ROM Cartridge which gives us 32,767 bytes to work with. You can view the full list of addresses and what they correspond to here. Note: you will see that 0000h to 00FFh is not really part of the ROM. In“0000h” and “7FFFh” the h stands for hexadecimal (hex) which is a way that’s used to express the addresses instead of just writing the decimal number; you can convert to and from hex by using an online calculator or if in Windows by opening the calculator and choosing scientific mode. 32K bytes for a Gameboy game sometimes isn’t enough so what they were able to do is have multiple 16K ROM banks and have a chip (MBC) to change the ROM bank if we requested it. We would then just re-read the same 16K address range and be presented with new 16K worth of data. For example, we could have 8 banks x 16K bytes which gives us 128K bytes to work with. You could have the main code in the first 16K bytes then ask the MBC to switch to the next 16K bytes because you might have an image on the 2nd bank and then switch to the 4th bank of 16K as you might have text there. So you can see how by having a MBC they overcame the issue of only being able to address 32K bytes. I’ve mentioned that we use hex addresses instead of just writing the decimal number and we know that there are 16 address lines (A0-A15) but let’s see how we visualise the conversion of hex to binary so that the appropriate address lines are set to 1 (high). Let’s take for example the hex address 0148h which is 328 in decimal but more importantly is 101001000 in binary. When we want to tell the ROM that we want to read from 0148h, we turn the address lines on or leave them off. As you can see the address lines are going from A0 right to A15 left and then we take our binary number and align it to the right. We would be turning on address lines 3, 6 and 8 which the ROM would read as 0148h; this is the basics of how address lines are used to tell the ROM the address we want to access. The only downside to this project was I had to rip the cartridge header from a Gameboy as I wasn’t able to find any online shops still selling them! I just built a small PCB that I mounted the header to and then just female headers on the other side, it worked well. 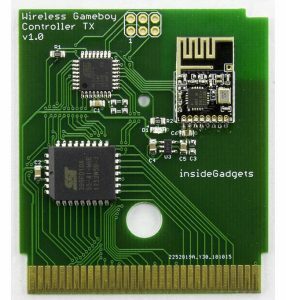 You can build your own Gameboy Cart Adapter here. 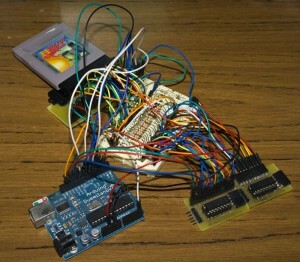 We need to connect the Arduino up to the Gameboy cartridge but we’ll need 26 lines and the Arduino only has 13 digital pins. What we can do is use our old friend the Shift Register (more about Shift Registers here) to shift out the address A0-A15 lines for us. Now all we need is 26 – 16 (address lines) + 3 (shift register lines) = 13 lines which is achievable as we can set some analog pins on the Arduino to act as digital pins. The data that we read from the ROM has to go somewhere right? We’ll be using the serial to transfer the data back to the computer. Let me say that when setting up the Arduino as we are using serial I’ve found that using digital pins 0 and 1 cause issues so we will avoid them, plus it says this in the Arduino Reference which I found out later. VCC we can connect to Arduino’s 5V pin. WR and RD which will be on digital pin 13 and analog pin 5 respectively. We will pull these to ground with a 10K resistor and we’ll connect a 470Ohm resistor to protect them when we do set them to high. A0 – A15 are connected through our shift registers. A0-A7 is handled by shift register 1 and A8-15 is handled by shift register 2. The outputs from the shift registers have 470 Ohm resistors (these resistors are optional but good if you are wiring this up for the first time. It appears the cartridge has some built in resistors somewhere.) We connect Clock to pin 12, Data to digital pin 11 and Latch to 10. D0-D7 will be on digital pins 2 to 9 respectively (D0 = digital pin 2, D1 is pin 3, etc). 470 Ohm resistors can also be placed on these lines for safety but once again they are optional. Reset is pulled up with a 10K resistor. 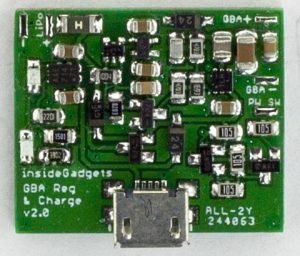 GND is connected to Arduino’s ground. The reason for setting up the computer side is so that we don’t have to use the Arduino serial monitor to receive the data, I mean who would want to copy and paste the ROM to a file themselves? We can utilise Python and create a script that will open the serial port and place everything read into a file. Python for me was a tricky language to deal, it’s not quite like C or Java. Firstly download and install Python 3.2 and pySerial, then download my iG_GBCartRead_ROM_Only_v1.0 script. To explain my script in short, it opens the serial port, waits for the START command, converts the serial data received and writes it into a file called myrom.rom then stops once the END command is received. 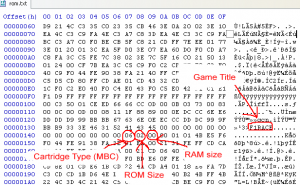 Before we dive into reading the ROM we need to know firstly which MBC the cartridge uses and how many ROM banks of 16K bytes there are, this is done by reading the cartridge header. There are many other bits of useful information in the header such as the game title, ram size, etc. A more extensive list can be found on page 56 of TheNintendoGameboy PDF, this PDF document is also worth keeping handy. This address defines which MBC the cartridge uses. At this address, the number of ROM banks is specified and is done by multiplying 32K by 2 times the number we read. There are exceptions to this rule. The first ROM bank 0 ranges from 0000h to 3FFFh and no switching of banks is required. Bank 0 will always be at this address and is like this way so that we can always read the Cartridge header no matter which MBC the Gameboy cartridge uses. Just our standard assignment of pins. We now set begin the serial connection, set the pins used to talk to the shift registers and RD/WR pins as outputs. 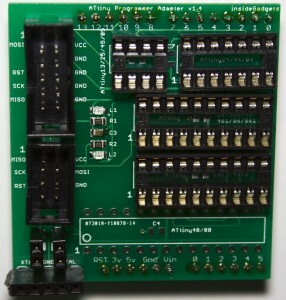 We set the digital pins 2 to 9 as inputs as they need to read the data that comes from the cartridge connectors D0 – D7. Now for the start of the main loop, we set up our address variable as an unsigned integer and it needs to be unsigned because we have a 16 bit address that is 2 ^ 16 = 65,536, so we range between 0 and 65,536. If we didn’t put it as unsigned the range would be -32,768 to 32,768 which would really mean 0 to 32,768 for us as we only deal with positive addresses (this would be fine because we never go over 32,768 but we’ll do things right). Thus once it would reach 32,769 it would “overflow” and actually become -32,768! 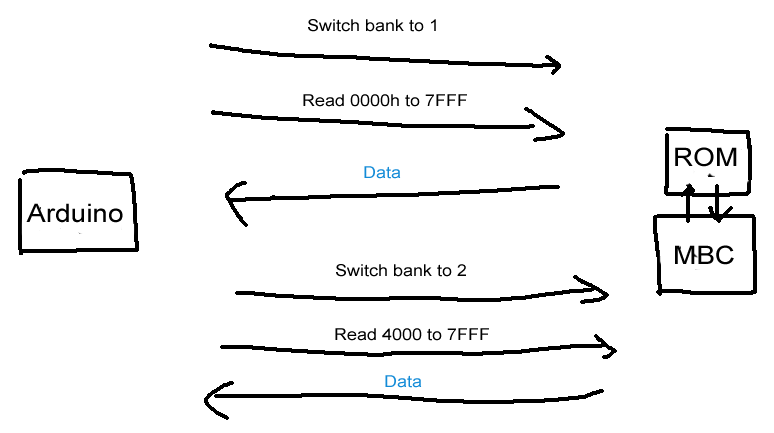 We set RD to low and WR as high in order to read the ROM, you can check what to set RD/WR to here. After that we send the text “START” by serial over to our computer. We begin our for loop used to read every address between 0000h and 3FFF which is ROM bank 0, so we set up x as 0000h and the end as 3FFF. Next is the standard Shift Register code, pull the latch to low, shift out the address and pull the latch to high. We delay 50 microseconds so the ROM has had enough time to register our request. For example, lets say the address is 3FFF (0011 1111 1111 1111). What you’ll notice is that we do “x>>8”, this means only give us the “most left” 8 bits and does this by moving the bits to the right by 8; we have a 16 bit address so moving all the bits to the right 8 times which means we are left with the “most left” 8 bits only. The other “1111 1111” bits have moved to the right that they have “disappeared”. The next part “x & 0xFF” we do an AND operator on the “most right” 8 bits. 1 AND 1 = 1, 0 AND 1 = 0. As we didn’t specify a 1 on the 8 “most left” bits this basically gets rid of them and we are left with only the 8 “most right” bits. So we’ve now split up the 16 bit address into 2 x 8 bit parts which we send to each shift register and then they send it to the A0-A15 addresses. We now read the 8 bits coming from the D0 – D7 address using the for loop. If we find any bit that is on we use bitWrite to set that bit to high on our bval variable, basically we are converting the hardware bits we are receiving from D0 – D7 into software bits in the variable bval. We then print out bval as a decimal number. After the code has read all the addresses, we print out END and then just stop. So now it’s time to test it out, go ahead and upload the downloaded “iG_GBCartRead_ROM_Bank_0.pde” file to your Arduino. Now open up the script by right clicking it and selecting “Edit with IDLE”. You will need to make a change in the script so the serial connections to the correct COM port on your computer, for me it’s COM2. You can find this out from the Arduino software by going to Tools -> Serial port when the Arduino is plugged in. Once you have made the change, hit F5 to run the script. You should see that some hashes should start printing every few seconds, once it’s done it will stop. Now let’s read the file called myrom.rom with a hex editor, the one I use is called HxD Hex Editor. If you scroll down just a tiny bit the data we’ll see is the cartridge header, can you see the game title? It’s located at 0143gh. 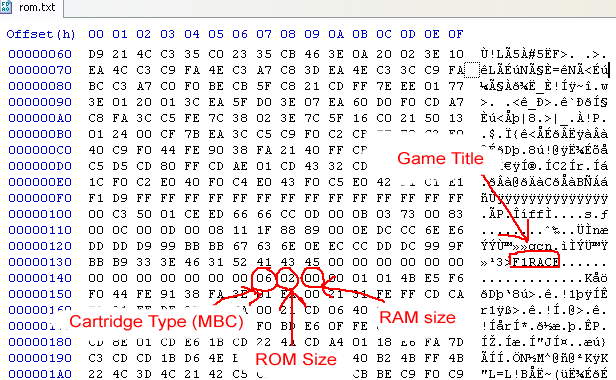 The cartridge type (MBC) is on 0147h and the ROM size (which is important to us in order to read the whole ROM chip) is at 0148h also the RAM size is at 0149h. We complete the following steps for MBC2; the only difference between the MBCs for ROM reading is what address you need to write to in order to switch banks, it’s a good idea to keep this link handy. Use the D0-D7 lines to write the ROM bank number we wish to use, e.g. 0000 0001 would select bank 1, 0000 0010 for bank 2, etc. We repeat steps 1 to 5 and specify the next ROM bank number in step 2 until all ROM banks have been read. If you recall the ROM size of my cartridge of F1RACE is 128Kbytes which means 16K x 8 banks, so we ourselves have to stop once we reach the 8th ROM bank otherwise we will receive duplicate data. Did you notice something weird with Step 3? Remember that we actually used D0-D7 before to read the data from the ROM but now we write data to it. What happens is that the MBC knows that we can’t write to the ROM so it intercepts our request and knows that we want to change ROM banks. Now for the code, we modify the main loop a bit and add a new function to switch ROM banks. We’ve now added a variable called romBanks which you need to change to the ROM banks to the number your Gameboy cartridge has (remember do this by reading Cartridge header – ROM bank 0). Now we have a for loop that loops 8 times because my ROM has 8 banks. What it does is in the first run when y =1, the selectROMbank method selects ROM bank 1 because we will actually be reading two ROM banks (0000h to 7FFF) in one go in the first run. Remember that Bank 0 is always at 0000h to 3FFF and Bank 1+ is 4000h to 7FFF. After the second or more runs, y is 2 (or more) which activates the if statement to change the address to 4000h because this is the address we use to read the other ROM banks. Next is the for loop we had before except we don’t assign the addr variable anything because we set that before in the if (y > 1) part, so all we do is set the end of the loop at 7FFF. Now we reach the selectROMbank function, it takes the bank number as the input. First thing it does is switch RD to 1 and WR to 0 as per the RD/WR page and then we just wait a little while. We set the D0-D7 pins as outputs as we will need to write to these pins soon. 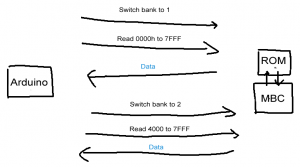 We set the address to 2100h as per the switch banks URL and do the usual shifting out to the shift registers. Now we select the bank we want to use. Using the AND operator with the bank input number and a multiple of 2 we are actually able to check which individual bits are enabled in the bank variable. Remember how we did hardware bits converted to software bits? We’re now doing the reverse of that. For example, if bank was equal to 3 the first (bank & 1) would pass as 11 AND 1 gives 1 and if statement executes. Next (bank & 2) would go through as 11 AND 10 gives back 1. For (bank & 4), this wouldn’t execute as 11 AND 100 gives 0. Next we set RD and WR back as they were so we can now read the loaded ROM bank. We now set the D0-D7 pins back to LOW and set them back as inputs so we are now ready to read the ROM bank. Before you upload this to the Arduino, you need to change the romBanks variable to the amount of ROM banks you have which as you should know is indicated by reading address 0148h and referencing that with page 56 of TheNintendoGameboy.pdf, for me it’s 8 banks. After uploading, go back to my script and run it. Just so you know I am in the process of making improvements to my script so it can adjust the ROM banks automatically, read our the game title, etc but that’s for another post. You should now see more hashes appear than last time and it will take a bit longer to complete too. And that’s it we’re done. I hope you’ve learned how we used the Arduino and some documentation to read the Gameboy Cartridge’s ROM and how the ROM banks work. In my next part, I’ll show you how we can read the RAM so we can read those game saves and hopefully even load our game saves to the cartridge if it ever gets erased. The GBCartRead project page can be found here which will contain the latest version of my Python script and Arduino code. Edit (21/03/11): GBCartRead has been updated to v1.1 which can automatically detect the number of ROM banks so you don’t need to change anything on the Arduino side. It will also print the Game Title, MBC type, ROM size and RAM size in the Python script. I have to say very nice write up for people looking to learn from you. Over all I think you should have just used a MCU that has enough pins on it already. I did this with a ATMEGA16 and it came out nice and small. I threw up some pictures. I used Java for dumping to the PC though. For the life of me I can not get Python and PySerial to play nice on a 64-bit machine. Thanks, your rom dumper looks like a very easy solution for this compared to mine! I finished up my Arduino cartridge reader a few days ago. I was drawn here by the link on HackADay today (well, yesterday now) and I was pleasantly surprised to see that someone had built the same thing using the Arduino at approximately the same time. For me, the reader portion is just a step on the way to building a flash cartridge writer so that I can load my own code onto my Gameboys. I wonder, are you planning on using yours as a cartridge writer as well? I plan on documenting my exploits, and if you are interested, I would really like to work together, or at least bounce some ideas back and forth. P.S. Cart adapter PCB is awesome. I’m definitely going to have to use that in later builds. Yeah it’s a coincidence! I looked around to see if anyone had done one using the Arduino and was surprised that it wasn’t done before, so thought I’d make a large post about mine. You should get some bonus points for soldering those wires to the GB connector! Yeah. I’m happy to see that other people are working on similar projects. It shows that I’m not wasting my time documenting my project, and it means that there will be more resources available that myself and others can reference. I do have a programming blog over at drunkencoders. I think I’m going to work updating it regularly and making it less ugly. I’m currently getting back in the swing of things after an awesome spring break, so there will probably be a few days of delay before I manage to get anything new up there, but I will spread the word when I have something noteworthy. Is there any way that I can/should contact you other than commenting on your blog? Also, stripping and soldering those 32 wires to the GB cart connector was a grueling experience. I do not recommend it. I look forward to examining your code when I have some free time. I had a surprising amount of trouble writing a serial protocol for communication between Processing and the Arduino, and I am interested to see if you had an easier time using Python. I like to document everything especially when learning new things, it helps to re-enforce what you’ve learnt (or well for me it does). I’ve heard about that Processing software, never really tried it out myself. Checked out your blog, hehe the Processing file called “crappyreader”. If you use the Pyserial then it makes it very easy to Python with serial, I didn’t need to use any checksums. The difficulty for me with Python was figuring out how to do things with the serial data because you have to encode it some special way otherwise it prints out all weirdly or just won’t work. The other thing is that you don’t use square brackets or semi-columns with it and it’s all about how you format your code, once you can adapt to that you should be write. Awesome gb cart reader! Can I add a link to this from my Gameboy programming blog? Hmmm… How long does this thing take to read one bank? With the serial communication set to 57,600 and delaying for 50 microseconds, reading the first bank 16Kbytes takes about 16 seconds. I’ve tried removing the 50 microseconds delay but that doesn’t make any changes. Now if I disable the serial printing of every byte read, set to 5 microseconds delay and just set it to print to serial once every 1,024bytes (to check it works), it can read the 16Kbytes in 6 seconds. im afraid i’ve fried the cart somehow though. i didn’t have any shift registers on hand so i was only going to use A0-A4, just to get a decent amount of bytes to compare to an already dumped rom. Damn that’s too bad, I’m hoping that the cart wasn’t a good game! Were you using resistors on the address lines just to be safe? Let me know how it goes because I think in a few months I might try to try to read the ROM from a SNES game too. Terrific post! Just letting you know haha. Keep up the awesome stuff. The best place to start would be at http://www.reinerziegler.de/readplus.htm. 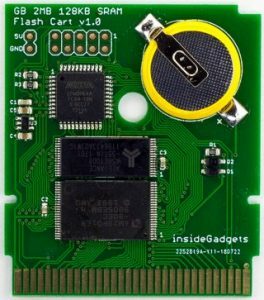 About half way down the page there is a schematic on how to build a GB Cart Flasher with the flashing software and it shows you how to wire up a flash chip to replace the cartridge’s ROM chip. 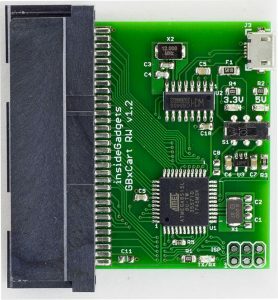 I am in the progress of building a gb cartridge reader, but I am not building it with shift registers instead I’m using a IOexpander, got any tips? any idea’s? Let me say it this way, how would you’ve written the code if your arduino had enough pins? If I wasn’t using shift registers then I would turn on and off each of the pins by using digitalWrite. 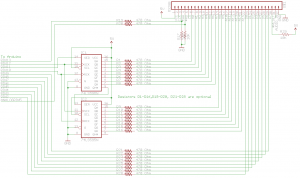 The Arduino software lets you read each bit of a variable by using bitRead. I would do a loop for 16 times, read each bit of the address and then do a digitalWrite HIGH or LOW depending if the bit was 1 or 0. Below is an example of the “shiftoutAddress” function re-written if our extra IO pins were numbered 20 to 36 and we assume that 20 is bit 0 (A0 in the schematic). // We need to read bit 0 of the shiftAddress variable, then bit 1, etc. Great site. Absolutely fantastic detail. Do you have an email I can grab you on? Have a few questions i’d be happy to ask you. Extremely impressive. 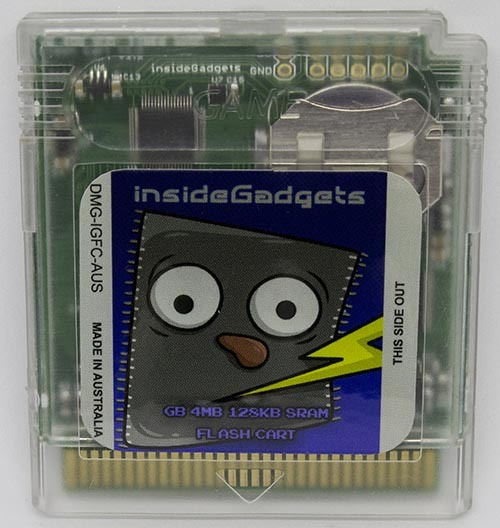 This kind of useful tech is rare, flash carts are not easy to make or easily findable. Great job on this. Can you clarify what the ‘protection’ resistors are for and why they are optional but recommended? They are there to prevent any potential damage to the gameboy cartridge and to the Arduino itself. If something is fails or is faulty then the maximum current is limited by the resistors, say if you connect the wires up incorrect, then without the resistors you could damage it. But once you have it hooked up correctly and tested it all works (and won’t make any changes to the wiring), then you should be able to remove the resistors as I believe the gameboy cartridge already has resistors internally. Right. I think I get it. Like if you accidentally shorted an output to ground, for instance, then that pin would source (sink?) a bunch of current when it goes high and potentially fry things? I want to use the same method to read an old ROM chip, the 2764. 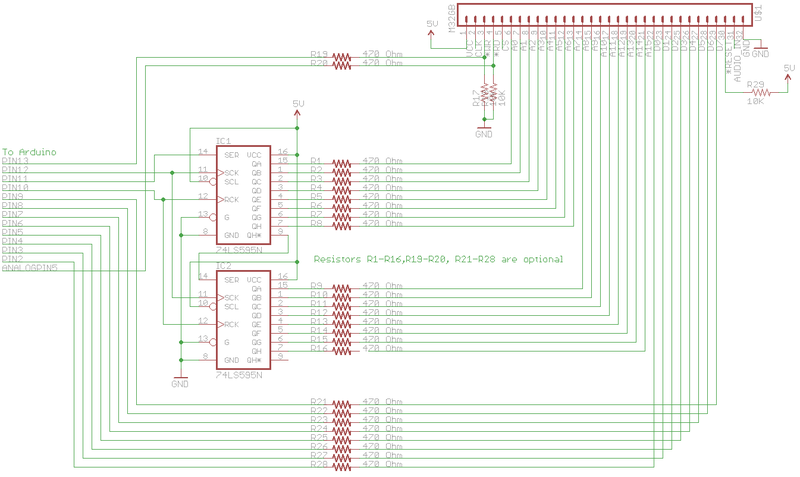 One more question: I noticed in your schematic that you’re using TTL shift registers (LC rather than CMOS HC or AHC). Is this a deliberate choice because the gameboy cartridge is TTL? My ROM is TTL, so I’m a little worried about getting the line levels compatible between it and the Arduino. My understanding is that CMOS to TTL should be OK with the same supply voltage, but that TTL to CMOS (ROM data out) may need pull up resistors. Yes, correct and you also never know if the device you are connecting to has input resistors or not, so best to be safe. Got it. And now I have a working EPROM reader, thanks to you Alex! Fantastic writeup and build! Thanks very much for the details! I have just finished up a ROM/RAM dumper following your instructions and it works great. I have a gameboy camera which I am wanting to get some pictures off, though it looks like the camera uses some non-standard MBC and RAM types? 4 – 1MBit = 128kB = 16 banks on a semi consistent basis. The weird thing is that every time I run through the script, I get different values being returned. Not even the title returns properly. It would suggest a problem with my hardware, but any other cartridge at all works fine. Do you happen to have any experience or further suggestions for gameboy camera support? Additionally, a minor [aesthetic] adjustment for your script for linux users. After you perform a sys.stdout.write(‘#’), place a sys.stdout.flush() in the next line, as the buffer is not automatically flushed unless an input is requested I believe. Making some changes to the arduino sketch, I have added a type 4 ramsize, which has 16 rambanks of 8K each. I couldn’t find any information on RAM bank switching, so I am unsure if your code will support 16 ram banks. I normally wouldn’t have any issues with just trying it out, however I do not want to lose the data on my GB camera, so I need to know that it won’t erase the data before I try it. Sorry for the triple post but I thought I would share some things I have discovered experimenting with the Camera. It appears that the camera’s hardware is performing some funny stuff. The first read from the Cart does produce the correct values, but subsequent reads appear to have some offsets applied to memory addresses? If I run the script a second time, I get incorrect header information. The only way to get correct header info again, is to plug the camera back into an actual gameboy and do a power cycle. As the script you have performs a header read at launch, then another header read when you issue a rom/ram dump, the dump was failing each time. One of two things had to be done to get it to work, either modifying your script to not perform the ‘HEADER’ request at the start, OR by starting the script to check the header, then when at the main menu pull the cartridge from the reader and power cycle it in a gameboy, then replug it back in. The ram dump now works correctly. Further still, the .sav file produced will not work with any emulator I have tried [again, due to some hardware controls in the camera’s ROM], they just appear as garbled black images. It is a windows application but it does work under WINE for any other linux users out there. Hi Josh, Thanks for all the information, I’m sure this will be helpful for others. With the .sav and the gb_cam_dump program, did it actually work – were you able to view your photos? Hi Alex, no worries at all! With all of the hard work you have shared, I am more than happy to share some extra findings! Also, to make sure I was reading the cartidge correctly, the following additions were added to the python script, simply adding the Camera MBC and 128K RAM types. I don’t know if it is relevant, but what Arduino model did you use? Or would it be recommended to find a GBC header? Received mine today, cut the sides of the header and was able to fit the Gameboy cartridge with no problems. This is all extremely impressive. This kind of thing always starts to make my head spin, so what you’ve done seems like magic to me. I have sort-of a weird question – I ended up with a bootleg copy of a GBA game, with a translation so bad it’s hilarious. It also doesn’t allow me to save. I’d like to make a ROM of this bootleg cart so that I can both save the game and progress, share it with my friends, and take nice screen shots of the funniest bits. Would this work for it? That sounds like a strange game you’ve got, unfortunately this product only works for Gameboy / Gameboy Colour games although the concept would be the same for GBA games. Hey, very cool project. How about the logic voltage of the gameboy? Can I drive the adress bus with 3,3 volt? What will be the data voltage be like? From what I can the cartridge will need 5V, one of the SRAM chips that I found the datasheet (http://www.sharpsme.com/download/LH5164A-DSpdf) for says it needs 4.5V minimum. Can I also use 74HC595N shift registers instead of 75LS595N? And if I can use 74HC595N shift registers which resistors do I have to use instead of 470 Ohm? Yes you can use just about any 595 shift register. For the resistors, they are mostly for protection, in the case that something may short out that it won’t deliver too much current. Anything from 220 Ohm to 10K should be fine. I’ve built the reader and it’s working. I get displayed the correct name of the game, rom size, rom ram, cartridge type and the data bytes on the serial monitor of the arduinoIDE. But the .exe file and the python script don’t work. If I start the exe. file, I get an error: “msys-1.0.dll not found” and if I start the python script on ubuntu, I get also an error: “name ‘ascii’ is not defined”? Are you using Python 3.1? and then nothing happen…I’ve not tested the Windows version with MinGW yet. I seem to have also had this issue now on a different computer. I installed MinGW and also msys_base when it came up with the package list. It looks like the msys-1.0.dll is in C:\MinGW\msys\1.0\bin but it’s not picking it up. Please copy C:\MinGW\msys\1.0\bin\msys-1.0.dll to the C_version directory. Also note that if you are changing between the C and Python version that you need to upload the Arduino sketch inside the C_verison or Python_version folders. Which Gameboy cartridges are giving you those results? I recall that sometimes the C program would do that when I was writing it but I thought I’d fixed it up. Have you tried the Python version? The python script doesn’t work so I will keep working with the c program ^^ I can’t dump Pokemon Yellow, Silver, Gold and Cristal. Very odd, I have Pokemon Red and can dump it without problems. Could you check in the Arduino serial if you write HEADER what it brings up? Also try the READROM command too? I’ve written a java program that can dump gb and gbc games. I’ve also changed a few things in the sketch. Instead of the task “HEADER” I’ve just used 1 as byte. So it sounds like the Python program or C program just didn’t work correctly or would you say it was the Arduino sketch? the sketch works without problems. But I’ve changed a few things (the tasks: ‘A’ instead of ‘HEADER’) and that only because of my java programm. The c program and the python script work fine. I think my windows pc has a bad usb port and on my linux pc the python script can’t send data through the serial port. I was thinking on something, and that was to maybe use a pair of 74HC590 (rigged as 14-bit counters) instead of the shift registers. Then use a pair of “analog in” outputs to controll the two high address lines. This would potentially speed up sequencial reads/writes signifficantly. And on the note of speed; Most Mask ROM typically have response times of less than 400ns, so a wait of 50ms is quite a bit of overkill. I am curious about the 50ms as well. From looking at the game-boy address pins with a digital analysiser they seem to change a lot faster than 50ms. Correct me if I am wrong but I am guessing the 50ms is actually there to allow adequate time for the serial write function “Serial.write(bval);” to dump the data to PC before latching in a new address and reading the ROM data lines again. I don’t seem to see the 50ms delay, but you might be referring to the delayMicroseconds(50). I agree it’s not needed when running on the Arduino software, because I later found out when you do “digitalWrite” it takes a few microseconds to do it (this probably applies to other functions) where as direct AVR code would do it in 1-1.5x the clock cycle. If you were to run this code on an AVR directly without Arduino code, then as Frode says you might need to delay 400ns. That sounds like a good idea, it should save you some overhead from not having to write to the shift registers. I’m interested to see how much faster it goes. Great project Alex! I recently sat down to attempt this myself, although I used an Arduino mega 2560 since I had one handy and it has 53 digital pins, removing the requirement for the shift registers. I actual stumbled across your guide after finishing my cart dumper, when researching for some information about building a flash cart, it seem liked the logical next step. However, I ran into complications and end up back on the net hoping to find somebody else who attempted the same. I wasn’t at all surprised when I found your project “Emulating the Nintendo logo on a Gameboy”, given I had previously found your “ROM dumper”. I was happy to see you ran into most of the same problems that I am having, (issues with noise and speed). After reading about your attempts I switched up to a 40Mhz microprocessor and I am now clearly seeing a pattern in the GB address bus (A0-A7) during boot up. In fact, the address patterns matches the address of the Nintendo logos location in ROM. However, in-between these addresses I am seeing random addresses being put on the bus. This has me stumped!! I tried adding some 47Khz pull down resistors on the address pins in case they were floating and I also added in a filter capacitor across the Vdd and GND pins. This helped smooth the CLK output of the GB but the address pins still seem to be random. Did you get any further with this project? And do you have any thoughts on why this “noise” is on the address pins. I have ordered a digital analysiser so that I can take a closer look at the timing logic. I am now assuming the GB writes the address pins and reads the data pins at a known time and that the key to intercepting these is knowing this timing but that doesn’t seem like a very reliable system. However, in-between these addresses I am seeing random addresses being put on the bus. I didn’t do anymore analysis into the random addresses, have you seen if they are truly random at every time you power the gameboy on? Did you get any further with this project? And do you have any thoughts on why this “noise” is on the address pins. I haven’t worked any more on this project, can you try to check the reset, rd and wr pins if there is any change when the randomness appears? It could be that the Gameboy is using the address lines for communication with other devices on board. I have ordered a digital analysiser so that I can take a closer look at the timing logic. Hoping it’s at least 20MHz or more, the more the better, because I didn’t know at the time but for example to capture a 1MHz signal you need at least 4x the bandwidth, so a analyser that can do 4 Megasamples per second. I am now assuming the GB writes the address pins and reads the data pins at a known time and that the key to intercepting these is knowing this timing but that doesn’t seem like a very reliable system. It also can write to the data pins too so be aware of that. I would say check the RD, WR and Reset pins to see if there is a better way to check when it’s going to ask something of the gameboy cart. Are you sure those addresses are random? When the Gameboy or GBC boots, it excecutes a small boot program stored inside the CPU itself, between address 0000h and 0100h (and 0200h-08FFh in addition for the GBC). This program sets up everything, copies the logo and displays it, and it also checks the checksum of the logo. The final thing this code does is to disable itself, and it can not be re-enabled without a power-cycle. It took a good decade before someone figured how to dump this bit of ROM, and I guess the external bus is tristated when it’s accessed due to sniffing protection. The GB and GBC runs a variation of the Z80 CPU, so I expect the timing to be much similar to those. Try the datasheet or one of the many manuals written for it if you’re interested in timing diagrams. Thanks for your input. Let me correct myself, random was a terrible choice of word. What I really meant was that from the perspective of the address pins I was expected to see the GB requesting the memory address between (0000h and 0100h). A sequential, ordered read. However, instead I was seeing some form of ordered memory read hidden among what appeared to be other “random” memory address. This is similar to what Alex saw when he attempted to emulate the Nintendo logo “http://www.insidegadgets.com/2011/04/23/emulating-the-nintendo-logo-on-the-gameboy/”. In fact I suspect that these “random” address as I called them as in fact deterministic. 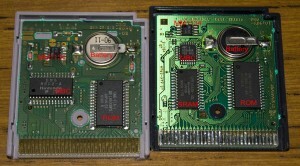 Alex suggested that the GB probably uses the address pins for more than just talking to the cartridge. I eventually figured out how to read the address lines correctly. It looks like the GB sets the CS pin low (active low) to lock in the correct address. There is a window of 700ns here to read the address lines, a challenge but achievable with a fast enough microcontroller. It seems you then have a further 6us to set the data pins with the appropriate data. Thanks for the ideas. I finally managed to get my hands on a digital logic analyser. I probed the WR, RD and reset pins. Nothing unexpected there, the WR pin goes high followed by the RD pin going low, as you would expect when the GB wants to read from the ROM chip. The reset pin just goes high and then stays that way. I also checked the CLK pin, thinking that it might be useful in determining when the GB reads the address pins. Perhaps its not useful but I did notice the address pin seem to change slightly after the rising edge of the clock. However, I couldn’t determine a decent time to read the address pins based on the clock alone. I then checked the CS pin which looked a lot more promising. The CS drops low for a small amount of time roughly 700ns before going high again for a further 6us. This pattern seems to repeat itself. This was interesting as my initial assumption was there must be some trigger that the GB uses to lock in the address pins and to read the corresponding data back. I realised that if you read the address pins on the falling edge of the CS pin then they make sense. The GB seems to be requesting sequential bytes of memory. The relatively long 6us delay between these low periods might be the time allotted for the cartridge to set its data pins before the GB attempts to read back the data. I have more testing to do to confirm this. Next I am going to try and write some code using an interrupt routine that reacts to the falling edge of the CS pin. Hopefully I can read the 16 address pins fast enough in the 700ns window. Then I will have 6us to look up this address in flash memory and serve the bits back to the GB on its data pins. I will let you know how I get on, thanks again for the help. Could you please check if you are running Python 3.2? O, I had python 2.7. Ok thanks. btw, I’m now running python 3.2.
i feel kinda stupid, i wired it wrong so i got this err0r (its my first time). I’ve now been able to build this, and I’m trying to add support for the Gameboy Camera. What I’ve found is that the CLK line has to be pulled low for the ROM to be accessible at all. If left floating, ROM reads just return High-Z garbage. Other things needed for GB Camera support is a check for Cartridge-type 252, and accordingly set 16 RAM banks of 8K. Requesting my post made July 5, 2011 at 12:23 pm be deleted, if possible, as I’m not particularly fond of my name being linked to that email in such a way. Hello, I was wanting to know if the Pokemon Red, Blue, Yellow, Gold, Silver and Crystal cartridges where able to be dumped, both the save and game data? Personally, this looks like a really fun project to do a DIY out of someday soon, only I really don’t want to bugger up any of the Pokemon Games I have, so in the mean time I think I will try and get one next time I am paid. Yep those games ROM can be dumped and save data copied to PC too. Just wanted to say thanks for that nice guide! I’m currently working on a gameboy cartridge reader without using a micro-controller, just by wiring some registers, logic components, timers, etc. to an RS-232 port, and your input has already proven a great help for me. 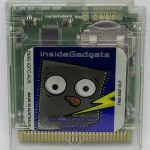 Are the pre-built gameboy shields still available to purchase (and ship to UK)? I see that the paypal link still seems to work but just wanted to check they were still available first. Yes there is 1 still available and we do ship to the UK. Great, thanks. I’ve ordered one now. Hi Alex, I have the problem to run Python program. I have a “Windows XP”, “Arduino_Uno” and a “Gameboy Cart Shield v1.3 R2”. I have downloaded and installing “Python 3.2”. I have downloaded and installing “Arduino 1.6.8”. I have downloaded and decompressed “Gameboy_Cart_Shield_v1.3_Rev1.zip”. I have downloaded and decompressed “iG_GBCartRead_ROM_Only_v1.0.zip”. So, I open “GBCartRead_v1_7_Rev1_Arduino.ino”, connect my Arduino_Uno with the Shield but without the game, and Upload. The message is: “Sketch uses 4,698 bytes (14%) of program storage space. Maximum is 32,256 bytes. In the folder “GBCartRead_v1.7_C_Interface” I open file “config.ini” and change the first number with my “COM” that uses Arduino, in my case “COM7”, the first number to be changed is “6”. Save and close. In the folder “GBCartRead_v1.7_Python_Interface” EDIT with IDLE the file “.py”, in to line 15 change my “COM” in “COM7” and save it. Thank you in advance, and sorry for my English, I’m an Italian user! Excuse me, you do not see the error well. You only need the files in Gameboy Cart Shield v1.3, so no need for iG_GBCartRead_ROM_Only_v1.0. You can choose either the C program or Python version. The C program is easiest as you don’t need to install Python or PySerial. But if you wish to use the Python version, as you are running Windows you need to download and install the pyserial-3.0.1.win32.exe, then give it another try. 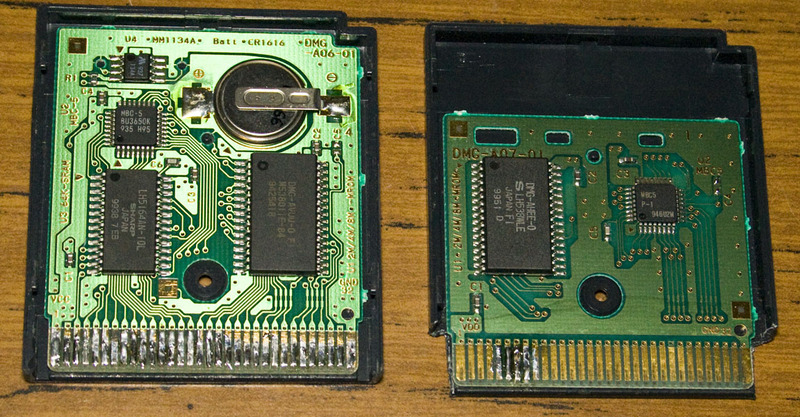 I’m in doubt of which is the latest schematic of the Gameboy Cart Shield and GBCartRead. 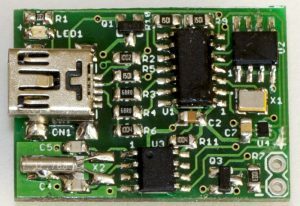 Just an idea: if you used the Arduino Mega 2560, the ATmega2560 chip’s external bus interface can make the dumping a whole lot easier. You can use an 74HC573 to demultiplex the address and data buses, and set up the chip to use 15-bit external address range, so you can use the data bus address 8000h to FFFFh on the AVR core as a big 32kB memory window directly accessing the cartridge. Now it would be simply stream the data out of that memory window. I am making that too, do you think SN74HC595N would work? I bought 2 of them because I couldn’t find 74LS595N, but it seems doesn’t match because it’s missing like 2 or 3 pins. Hi Kanjii, yep those will work, they seem to have the same amount pins, I think any 595 should work. Hey Alex, thanks for the response! I just finished, sadly, it seems doesn’t work because I dump the ROM or the SRAM, and everything gives me 0KB, did I put something wrong? Were you able to read the header ok? Depending on your OS, there could be file permission issues so perhaps try running the program as administrator? You could also try to open the serial monitor on the Arduino application (you’d have to modify the baud rate to say 115,200 or similar) and then try typing into the serial monitor “HEADER” and press enter. Then try “READROM”. See if you get any data back on the serial monitor. Thanks Alex again for the response. Also, if I just want to write and backup SRAM, does all pins needs to be conected? Yep all the pins need to be connected for backing/restoring up the SRAM. Could you try to change the “Serial.begin(400000);” to “Serial.begin(57600);”, flash that to the Arduino and then try again in serial monitor (also make sure you select 57600 baud in the serial monitor too). Hey there Alex thanks for helping me again. I already checked everything again and still doesn’t work. Arduino returns me nothing. I already tried that, still doesn’t work. I tried with different cartridges and still doesn’t work. 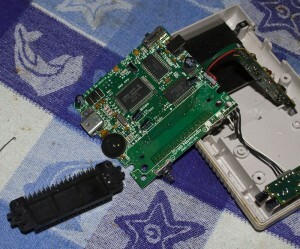 (funny thing is in the cartridge I checked if there was voltage and indeed, it doesn’t delete SRAM data when I connect it to the DMG Slot to the arduino, that’s nice.) I am using the lastest release of your GBCartRead also. I think next reply I leave you I’ll make a new one because this is getting smaller. Anyway, thank you very much Alex for helping me. Could you try the Arduino 1.0.5 software? I wouldn’t plug in any carts to it at the moment until you verify the serial monitor side of things work. How about if you only have the Arduino plugged in and nothing else? What if you try the serial monitor example in the Arduino software? Okay, remember when I said I soldered the cartridge slot directly from the motherboard? There is voltage on the motherboard too. I already tried Hello World example on Serial Monitor and works. (Lastest release and 1.0.5) I am using 1.0.5 r2 this time. Still doesn’t work, I put “HEADER” and “READROM” on the Serial Monitor and returns nothing. Do you think maybe it’s because I soldered it directly from the motherboard? 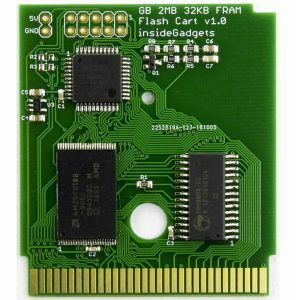 (It’s a DMG Motherboard btw, and I followed the schematic that is on your lastest release of your GBCardRead) Maybe should I try the old one? Also, like I was saying, the LED on the pin 13 it’s always on when I connect 5V directly, this one should be on? Oh yeah, I tried to read the rom and header on arduino with my zelda link awakening DX game and the SRAM was deleted lol. Still working fine, just the save files are gone. Do you think did I messed it again? I also disconnected everything in my Arduino, nothing is connected, I tried the serial monitor thing and still doesn’t returns nothing. Oh, if you soldered direct to the cartridge slot which is still in the DMG, then I would expect the DMG may power up and try to access the cart. Hmm at least we know the serial example works which is a good step. Usually the LED pin 13 should blink a couple of times when you power up the Arduino but after that it shouldn’t stay on. For me, it blinks once when I open up the Arduino serial monitor. I restarted everything, and now the pin 13 LED doesn’t keeps turns on. I also checked everything again, and now everything is fine. Now it works, but it there is something weird. I already tried with 7 different games and doesn’t work, it keeps saying the same message. This time the SRAM wasn’t deleted because I discovered when I eject the cartridge while the arduino is on, the SRAM can be deleted. So, I turn off my arduino when I change every cartridge. It sounds like all the data pins may all be staying high and thus returning 255 / Not found. Also about the serial monitor not returning anything, is the baud rate still 400000 or changed to 115200? Since the C interface did return something, it sounds like it’s still at 400000. Yeah, I tried in Serial Monitor with 115200 baud rate and didn’t return anything. Oh yeah, I also tried HEADER and READROM in Serial Monitor, returns me nothing. I’ve been working on this again, now I am using a DMG slot, this time isn’t directly connected to the motherboard. This time works sometimes? Now Serial Monitor returns me numbers. I tried to use C interface and I couldn’t dump the ROM. I tried with my Pokémon Gold JP, worked, but ROM and SRAM was corrupted. Do you think maybe it’s because a poor connection? Also thanks for helping me out dude. Yes it could be a bad connection, check WR/RD/CS/Reset lines. Also is the Arduino running at 5V? With Pokemon Gold, when you ran HEADER what did it come back with? If you compare the Pokemon Gold ROM to one you find online, if the first 16KB matches then it might be having issue with bank switching. insideGadgets © 2019 All Rights Reserved. 31 queries in 0.169 seconds.